Most people with diabetes know when they are low, but others have difficulty detecting it or are completely unaware. This is known as “hypoglycemia unawareness” or “impaired hypoglycemia awareness.” In this article, we’ll break down what hypoglycemia unawareness is, what factors increase the likelihood of experiencing it, and what steps you can take to reduce your risk. 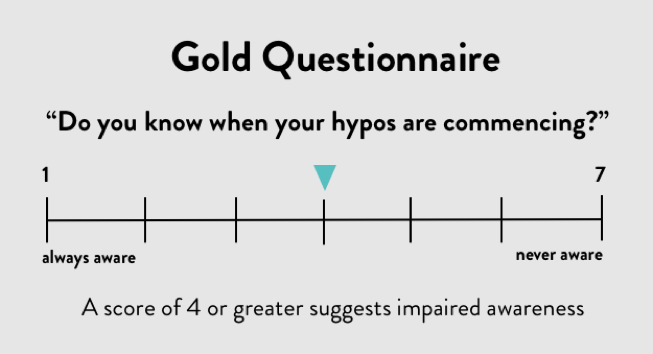 Do I have hypoglycemia unawareness? What is impaired awareness of hypoglycemia? Hypoglycemia can be caused by excess insulin, missing a meal without reducing medication, exercise, alcohol, and other factors. Sulfonylureas, a pill for type 2 diabetes, are also known to increase the risk of hypoglycemia. “Hypoglycemia unawareness” or “impaired awareness of hypoglycemia” occurs when someone doesn’t experience or perceive the symptoms of hypoglycemia, which typically occur when blood sugars fall below 54 mg/dl (3.0 mmol/L). See a list of common symptoms below, which stem from the body’s natural response to very low blood sugar. Studies show that those with hypoglycemia unawareness are at much higher risk for experiencing “severe hypoglycemia” because they are less likely to recognize early “alert” signs, such as shakiness, hunger, or sweating (these symptoms are also known as “autonomic” symptoms). Other symptoms include neuroglycopenic symptoms, which result from impaired brain function due to low blood sugar, as well as nonspecific symptoms (see table below). About one in five people with type 1 diabetes and one in ten with insulin-treated type 2 diabetes report experiencing hypoglycemia unawareness. Going low while sleeping. Many people develop hypoglycemia while they are asleep and are not able to perceive the symptoms or treat the low. If this happens frequently, it can affect the ability to detect hypoglycemia warning symptoms while awake. Exercise. The likelihood of hypoglycemia is increased both during and after exercise, when the body’s tissues are more sensitive to insulin. This effect can be delayed and occur up to 15 hours later, especially if the amount of exercise was unusually strenuous. Having diabetes for a long time. One study found that nearly 50% of people who had used insulin for over twenty years had developed impaired hypoglycemia awareness, while only about 20% of those who were on insulin for fewer than ten years experienced this problem. People who have had diabetes for longer are more likely to have been exposed to multiple episodes of hypoglycemia, which has been shown to contribute to hypoglycemia unawareness. Age. As people age, they start to experience “cognitive” symptoms like slowed thinking, confusion, and difficulty speaking at the same time as “autonomic” symptoms like shakiness, hunger, or sweating. The cognitive symptoms can therefore interfere with recognition of hypoglycemia. At younger ages, people typically recognize hypoglycemia more frequently because they experience “autonomic” symptoms before “cognitive” symptoms. There is no exact age when this effect begins to take place, as the process of aging varies so widely. 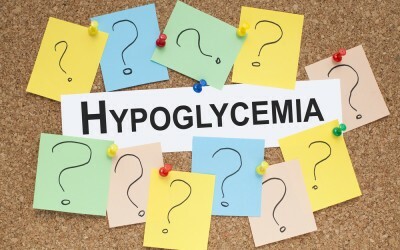 However, some studies have shown that hypoglycemia unawareness occurs more frequently in people above the age of 60. Consuming alcohol. This can, in the short term, lower your ability to recognize typical symptoms and impair your liver’s ability to release glucose when your blood sugar is too low. These effects typically last as long as it takes your body to process the alcohol. There is no evidence that alcohol increases hypoglycemia unawareness in the long term unless chronic, heavy drinking leads to permanent liver damage. That in turn increases the risk of severe hypoglycemia. Certain prescription drugs. Non-selective beta-blockers used to manage high blood pressure, like Inderal (see here for a complete list), may reduce your ability to recognize hypoglycemia. Selective serotonin reuptake inhibitors (SSRIs) used to treat depression may also have this effect. Common SSRIs include Lexapro, Prozac, and Zoloft. Check what glucose level at which you are recognizing hypoglycemia. If you recognize hypoglycemia only when glucose is far below 54 mg/dl (3.0 mmol/L), consider taking steps to reduce the number of times your blood glucose falls below this level – we share some tips below. This may also help to reset symptom onset and/or recognition for a higher glucose level. By measuring blood sugar several times daily, many people with impaired awareness can identify potential hypoglycemia and reduce the risk of developing low levels without warning. A number of clinical trials have shown that seeing your glucose levels in real-time (via measuring tissue fluid) may help prevent hypoglycemia. While fingersticks give a snapshot at a single point in time, CGM provides a glucose value every five minutes as well as trend information and optional alarms, alerting users of lows when they start or even before they happen. Continuous glucose sensors that are currently available include: Abbott’s FreeStyle Libre; Dexcom’s G5; Medtronic’s Guardian Sensor 3, Enlite, and Guardian Connect (outside the US); and Senseonics’s Eversense (outside the US). FDA-cleared apps like iSage Rx and My Dose Coach may also be helpful for people with type 2 diabetes who would like more frequent guidance for dosing basal insulin. If possible, switch to an insulin analog or next-gen insulin – especially one of the newest long-acting (basal) insulin analogs like Toujeo or Tresiba. Common basal insulin analogs include Basaglar, Lantus, and Levemir. Next-generation insulins associated with less nighttime hypoglycemia include Toujeo and Tresiba. If possible, avoid using older, less predictable insulins like NPH (also called “N”). Fast-acting (mealtime) insulin analogs include Humalog, NovoRapid/Novolog, Apidra, and recently approved Fiasp. Inhaled insulin Afrezza is ultra-rapid-acting, and some users report less risk of delayed hypoglycemia. Access can be challenging – work with your healthcare provider, and see our various strategies to gain coverage in the US through our access series. For people with type 2 diabetes on insulin therapy, taking a GLP-1 agonist may reduce the need for boluses (mealtime insulins), which may reduce hypoglycemia. GLP-1 drugs include Victoza, Ozempic, Trulicity, and Bydureon. Structured training is in-person training with a doctor, nurse, or diabetes educator who will help on how to improve insulin use and on how to anticipate an increased risk of low blood sugar. They also help manage mental barriers associated with going low. If you have never worked with a certified diabetes educator, it is especially encouraged! You can use this online tool from the American Association of Diabetes Educators (AADE) to find a program near you. Medicare and most private insurance plans cover up to 10 hours of initial training with a diabetes educator, although people covered by Medicare have to pay 20% of the session’s cost. This free, online training also provides general information on how to recognize and treat hypoglycemia. Similar to CGM, automated insulin delivery (AID) is technology designed to remove constant monitoring and decision-making to help users manage blood sugars. AID systems take CGM values every few minutes and run them through algorithms that decide how much insulin to deliver via a pump. As blood sugars fall, insulin is reduced or suspended, which helps prevent hypoglycemia. Medtronic’s “hybrid closed-loop” MiniMed 670G is FDA-approved and available for users in the US. The previous version in the US, the MiniMed 630G, has low glucose suspension – an algorithm that suspends basal insulin delivery when blood sugars cross a low threshold. However, it does not increase insulin delivery for high blood sugars or predictively suspend basal insulin delivery before a low is reached (as the MiniMed 640G, available in Europe, does). Many more AID systems are in development and expected to launch in the next three years – see a list here. Many people with diabetes are also using do-it-yourself AID systems such as Loop and OpenAPS. While impaired awareness of hypoglycemia can be a serious issue for some people with diabetes, risk can be significantly reduced with the right tools, resources, and awareness. Let us know if you have other ways to tackle hypoglycemia unawareness. Special thanks to Professor Simon Heller and Professor Brian Frier. A European study called “IN CONTROL” (published in 2016) found that in people with impaired awareness of hypoglycemia, CGM drove a 58% reduction in severe events (14 events with CGM vs 34 events without CGM). Additionally, those on CGM spent about an hour less per day below 70 mg/dl. The German HypoDE study, only recently published in the Lancet, showed that CGM reduces hypoglycemia in people with type 1 diabetes who have impaired awareness of hypoglycemia and are on multiple daily injections of insulin. Relative to a group using fingersticks, individuals using CGM had 72% fewer episodes of hypoglycemia, defined as 20 or more minutes at or below 54 mg/dl. In the IMPACT trial, Abbott’s Freestyle Libre decreased time spent below 70 mg/dl by more than one hour per day, and decreased time spent below 45 mg/dl by 33 min per day. A small trial that specifically studied people with hypoglycemia unawareness found that by using CGM, severe hypoglycemia was reduced by 93% (from 8 to less than 1 episodes per year). In the DIAMOND trial, people on insulin injections who wore a Dexcom CGM spent 30% less time under 70 mg/dl – about 23 minutes a day – than those who used traditional fingersticks to guide their treatment. One study found that switching from a human insulin to an insulin analog (this trial used Levemir) resulted in nearly 30% fewer events of severe hypoglycemia; this effect was particularly valuable in lowering the frequency of nocturnal hypoglycemia. Additionally, in a long-term study called DEVOTE, one of the newest next-gen basal insulins, Tresiba, reduced the risk of severe hypoglycemia by 40% (by 53% overnight) compared to Lantus. A study published in Diabetes Care found that taking Bydureon instead of mealtime insulin Humalog in addition to basal insulin and metformin resulted in less hypoglycemia (30% of participants on Bydureon vs. 41% of participants on Humalog). A recently published review article found similar trends across existing literature on the topic. The pivotal trial with Medtronic’s MiniMed 670G revealed a 44% decrease in hypoglycemia in adults with type 1. In children with diabetes, predictive low-glucose insulin suspension (algorithm proactively suspending insulin delivery when blood sugars are trending low) decreased nighttime hypoglycemia by ~50%.